The pop-up space, which features hundreds of tweets and interactive features, offers insights into the President's likes (himself) and obsessions (Kristen Stewart's love life). “Daily Show” host Trevor Noah at The Donald J. Trump Presidential Twitter Library. Donald Trump’s Twitter feed has become the most reliable generator of news in a world that’s not lacking for headlines. It may feel like questionable journalism, but there’s often good reason for the press to seek out words from the President himself – especially when he refuses to hold press conferences or conduct interviews with legitimate reporters. That’s why “The Daily Show” has created a temporary Presidential Twitter Library in New York City that serves as a hysterically tragic look at the mindset of the leader of the free world. Just steps or, as host Trevor Noah noted, “within golf cart distance” from Trump Tower on Fifth Avenue, the library is a free, interactive experience that acts as a living shrine to the Commander-in-Chief’s favorite mode of communication with the county. “I hope that everyone who’s a fan of what Donald Trump tweets everyday will come and experience this with us,” Noah said. Noah and “The Daily Show” correspondents Jordan Klepper and Hasan Minhaj guided the press through a sneak peek of the library on Thursday evening, and explained the inspiration behind the exhibit. “Every president since I believe FDR has had a Presidential library, so we were thinking, what is Donald Trump’s library going to be filled with? He’s not a man of art or literature.” Minhaj said. And then, the answer came to them. “We thought, he speaks on Twitter, are they gonna put those on the wall? And it was like, well there’s an interesting idea. What if we got there a little bit faster, because who knows how long he’s going to be in office,” Klepper added. 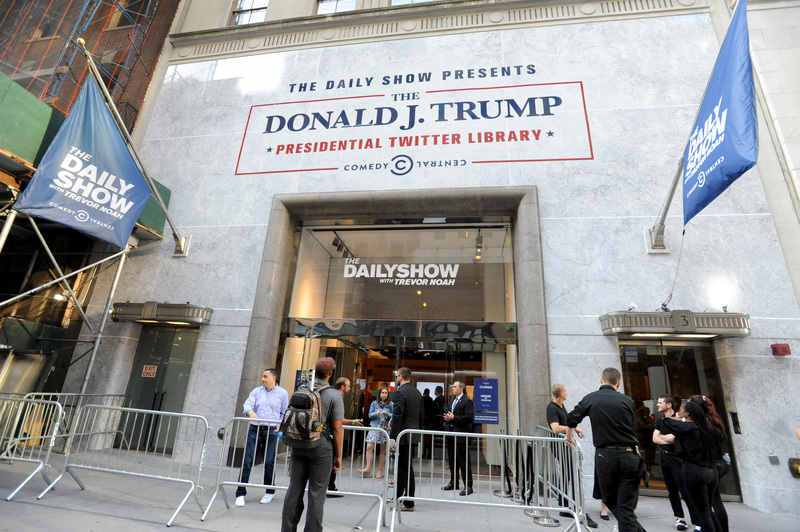 The Donald J. Trump Presidential Twitter Library in New York City. 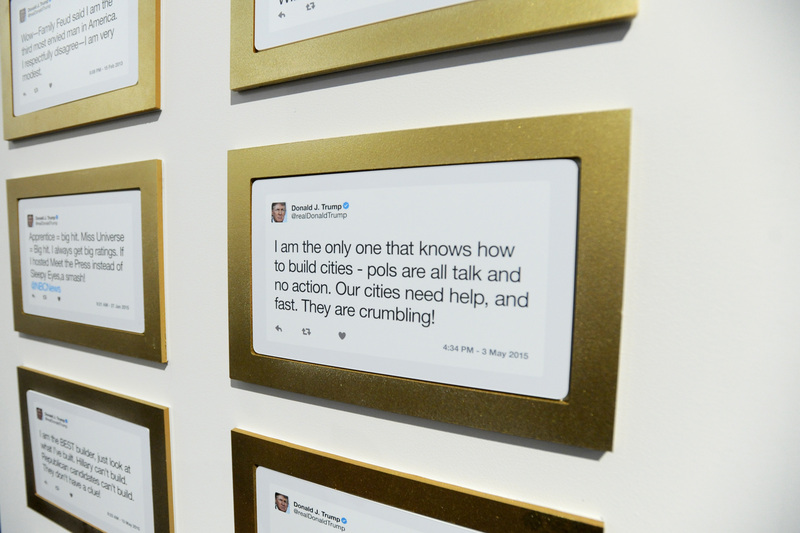 The exhibit isn’t just dedicated to Trump’s tweets, although they are sprawled across walls in various gold frames. More importantly, the space serves to expose Trump’s personality via the platform. The birther tweets have their own three-sided wall, but some of the more special – and infamous – tweets, like “covfefe” or “Cinco de Mayo,” are given places of honor in gilded, lamplit frames befitting the Metropolitan Museum of Art. Some of Trump’s tweetstorms, like his rantings about Kristen Stewart and her relationship with her “Twilight” co-star Robert Pattinson, are collected and given medal ratings (K-Stew earned a gold medal). Although the exhibit encapsulates hundreds of tweets, even Noah had a hard time picking the best one. Beyond just framed tweets, some of hands-on exhibits include a cheeky “tax vault,” complete with a snoozing security guard; a magnetic poetry version of Trump’s twitter feed, where visitors can craft their own Trump tweets; and a golden toilet inside of a faux Oval Office (flanked with both American and Russian flags), where visitors can compose tweets under the handle “Commander-In-Tweet” while wearing a bathrobe and more. There is also a live feed of Trump’s Twitter feed that will alert the room if a tweet is posted. Although reading through the tweets can be humorous, they also give insight into the President’s mindset, including his likes (golf, himself) and dislikes (he really hates “Modern Family”), and how often he contradicts himself (a lot). The Presidential Twitter Library will undoubtedly attract many visitors when it opens to the public on Friday, but it is slated to close its doors for good on Sunday evening. While its future is still uncertain, Noah noted that “The Daily Show” were hoping to take the exhibit around the country in the future. And with the President still blasting off early morning missives on a regular basis, it’s safe to day there will be no shortage of material should the library find a second life on the road.